To study solution stoichiometry, we must know how much of the reactants are present in a solution and also how to control the amounts of reactants used to bring about a reaction in aqueous solution. ** The concentration of a solution can be expressed in many different ways. Here we will consider one of the most commonly used units in chemistry, molarity (M), or molar concentration. ** Molarity is The number of moles of solute per liter of solution. where (n) denotes the number of moles of solute and (V) is the volume of the solution in liters. ** Note that concentration, like density, is an intensive property, so its value does not depend on how much of the solution is present. we have [Ba2+] = 1 M and [NO3- ] = 2 M and no Ba(NO3)2 units at all. 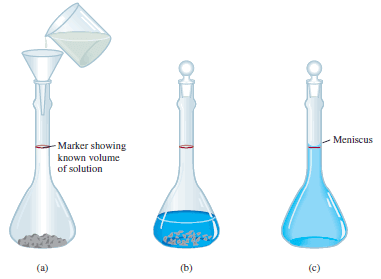 (1) The solute is accurately weighed and transferred to a volumetric flask through a funnel. (2) Water is added to the flask, which is carefully swirled to dissolve the solid. (3) After all the solid has dissolved, more water is added slowly to bring the level of solution exactly to the volume mark. 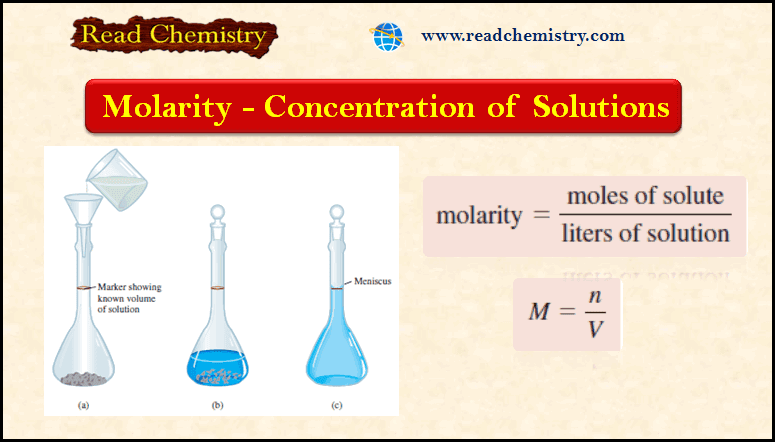 Knowing the volume of the solution in the flask and the quantity of compound (the number of moles) dissolved, we can calculate the molarity of the solution using Equation (1). Note that this procedure does not require knowing the amount of water added, as long as the volume of the final solution is known. Example (1): How many grams of potassium dichromate (K2Cr2 O7) are required to prepare a 250 mL solution whose concentration is 2.16 M ? How many moles of K2Cr2O7 does a 1-L (or 1000 mL) 2.16 M K2Cr2O7 solution contain? A 250-mL solution? How would you convert moles to grams? [2 mol/L × 0.25 L × 300 g/mol] = 150 g.
So the answer is reasonable. Example (2): In a biochemical assay, a chemist needs to add 3.81 g of glucose to a reaction mixture. Calculate the volume in milliliters of a 2.53 M glucose solution she should use for the addition. We must first determine the number of moles contained in 3.81 g of glucose and then use Equation (2) to calculate the volume. One liter of the solution contains 2.53 moles of C6H12O6 . Therefore, the number of moles in 8.36 mL or 8.36 10-3 L is (2.53 mol × 8.36 × 10-3) or 2.12 × 10-2 mol. The small difference is due to the different ways of rounding off.